Dinky Hocker Shoots Smack! 1972 Tucker Woolf, finds a cat but has to give it away due to his father’s allergic reaction. He then meets Dinky Hocker, a girl in the neighborhood (Brooklyn Heights), when she responds to the sign he puts up for his cat asking, “Do you feel unwanted, in the way, and the cause of everyone’s misery?…If you know how a loser feels and want to help, call Main 4-8415. (p. 6)” Tucker gradually gets to know Dinky and about her “issues”, a main one being that her mother is eager to help drug users but ignores Dinky’s needs. Dinky copes with neglect by overeating. If I Love You, Am I Trapped Forever? 1973 Alan Bennet narrates a story about his classmate, Duncan Stein, who is nicknamed “Doomed”. Duncan’s parents are in town to form a half-way house for alcoholics. The story follows Alan and Duncan through their last year of high school in Cayuta, New York. The Son of Someone Famous 1974 Adam Blessing deals with having a famous politician father and his actress girlfriends. In the meantime, he becomes friendly with 16 year old Brenda Belle Blossom. Is That You, Miss Blue? 1975 Flanders Brown, 14, narrates her experience at boarding school. Miss Blue is the faculty member assigned to live on Flanders’ floor. Along the way, Flanders meets Carolyn Cardmaker, who’s old hat with going to school away from home, and another student, Agnes. Based on Kerr’s own boarding school experience. Love Is A Missing Person 1975 Suzy Slade, of the Long Island Slades, describes her life with her sister, Chicago, moving back into town and her parents, who are divorced from each. She also observes relationships around her like the one between her friend Nan and the famous Roger Coe. I’ll Love You When You’re More Like Me 1977 Wallace Witherspoon, Jr., son of a mortician, has his share of friendship and romance during the summer before his senior year of high school. But he finds some differences can be resolved and that others are more challenging. Gentlehands 1978 A Long Island teenager, Buddy Boyle, experiences summer romance with Skye Pennington, a girl with better socioeconomic status than he. To impress her, he takes her to his estranged grandfather’s estate, thus starting a relationship with him. His grandfather’s past is clouded with mystery as someone else is in the area investigating the existence of a Nazi war criminal by the nickname of “Gentlehands.” Does Buddy’s grandfather know anything about him? Little Little 1981 Sydney Cinnamon, who’s found fame as a cockroach, co-narrates this story with Little Little La Belle, who’s been raised more privileged and protected. She is a “p.f.”, a perfectly formed dwarf, while Sydney, also a dwarf, has a hump on his back. Aside from class differences, these physical differences seem to have also contributed to their perspectives on life and others’ views and expectation of them. M. E. Kerr BooksWhat I Really Think of You 1982 A contrasting look at two “P.K.’s”, or Preacher’s Kids, Opal Ringer, whose father is a Pentecostal preacher with a dwindling congegration, and Jesse Pegler, whose father is a television Evangelist. 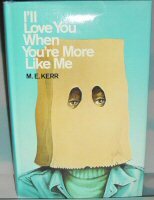 Me Me Me Me Me: Not a Novel 1983 M. E. Kerr tells her readers a little something about her childhood, adolescence and early adulthood, not necessarily in that order, and traces her development as a writer. She shows how events and people in her life inspired themes and characters in her writing. 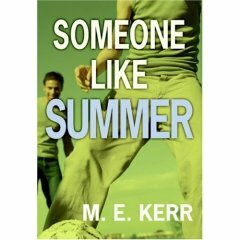 M. E. Kerr explains in the introduction that she wrote this book in response to readers questions about whether things that happen in her books happened to her. Him She Loves? 1984 Henry Schiller, 16, narrates the story of his family’s move to Seaville, Long Island and their new German restaurant. Henry has eyes for Valerie Kissenwiser who is Jewish (he is not) and whose father forbids their dating. I Stay Near You 1985 “I Stay Near You” refers to an inscription in a gold ring, the Storm family has as an heirloom and tradition to pass it down from father to eldest son. The story follows three generations of the Storm family via Mildred Cone, a harpist whose life intersects with the Storms’. Night Kites1986 Erick Rudd, a teen, narrates the story of how his family deals with life when his older brother, Pete,returns home living with but slowly being overcome by AIDS. This book was written in the early days of AIDS awareness, before people were very educated about the virus. In fact, this book has the status of being one of the first books written about the subject in either young adult or adult fiction. The uncertainty and fear stirred up by Pete’s poor health is reflected by family members and citizens of the town. M. E. Kerr says that when she wrote this book, she really thought that the epidemic would be short-lasting and that a cure was around the corner. Little did she know that people would still be able to relate to this story over a decade later. Fell 1987 John Fell (“Fell”) is the protagonist of this story which is divided into two parts. In the first part, we learn about Fell, a junior in high school, and his social life and family life. Then the stage is set for the second part which can be described as a mystery involving his arrangement with a wealthy man and an exclusive prep school, Gardner. We also learn about the Sevens Club, an exclusive club at Gardner. Fell Back 1989 The sequel to Fell, the story picks up where the last one ended. John Fell is still a student at Gardner. He investigates the murder/suicide of another student. Once again, the Sevens Club plays a pivotal role in the motivation of various characters. Fell Down 1991 This book is the third installment of the “Fell” mystery series. John Fell investigates the death of his friend. In doing so, he learns a little about the world of ventriloquism. The book jumps between the past and present to bring the story together. Linger 1993 Gary Peele, 16, narrates this story set at the time of the Gulf War. The center of activity is an upscale restaurant owned by the Dunlingers and named “Linger”. Gary’s brother, Bobby, has gone overseas to fight in the war. Prejudice, bigotry and hypocrisy play a role in the lives of the townspeople. Deliver Us From Evie 1994 Parr Burrman narrates the story of life on his family’s farm and everyone’s reaction to his sister Evie’s romantic relationship with Patsy Duff, a girl from the wealthiest family in town. Familial conflicts arise. Friendships and romances and career-track choices, in Parr and his older brother Doug’s lives are also addressed. Hello, I Lied 1997 Lang goes to spend the summer on Long Island with his mother on a rock legend’s estate where she’ll be working. He has to leave his boyfriend, Alex, in New York City, where they both live. Enter Huguette, a girl who means a lot to the rocker and could mean a lot to Lang by summer’s end. Blood on the Forehead: What I Know About Writing 1998 M. E. Kerr gives her readers writing tips through examples of her own writing. Included in the book are five short stories and chapters from four of her novels. What Became of Her 2000 The story is set in a small town in Pennsylvania and centers around the goings-on and residents of a mansion on a hill, known as Peligro. When the drama opens, Edgar (E.C. ), 16, is invited to Peligro with his mother, an astrologist. There he meets Rosalind Slaymaster, her adopted niece, Julie, 15, and her leather “son,” Peale. Once E.C.’s best friend Neal, 18, meets Julie, the three become fast friends. Still, there is a mystery surrounding Rosalind Slaymaster and her return to the town that she now practically owns. As the three teens learn more about each other, elements of the past rise up to challenge their friendship. The Books of Fell 2001 The three books in the Fell mystery series are now available in one. For plot summaries, see above (Fell, Fell Back and Fell Down). Slap Your Sides 2001 Hitler is on the rise and America has officially joined WWII. Bud Shoemaker becomes a Conscientious Objector due to his religious beliefs and he, along with his younger brother, Jubal Shoemaker and the rest of his family are challenged to stand behind his CO status. Jubal’s friendship/romance with Daria is also filled with tension in part from the typical issues of teen relationships and in part from the dissenting beliefs about Bud’s refusal to take part in combat while other men from their small hometown in Pennsylvania are fighting abroad. Someone Like Summer 2007 Annabel Brown meets Esteban Santiago and life becomes a little more interesting. This story, set in the Hamptons on Long Island, is about teenage romance as complicated by the boy being an illegal immigrant trying to make ends meet and the girl being part of a community where the residents have strong feelings about the illegals. Annabel also learns Esteban’s family and friends have strong feelings about him dating a Caucasian. But for Annabel and Esteban, they can’t help the attraction they feel towards each other and desire to see how their relationship might develop despite enormous obstacles. Shoebag 1990 A young male roach by the name of “Shoebag” wakes up one day and finds that he’s become a human boy. He’s confused, his family is afraid of him, and he just wants to keep on living the life to which he’s accustomed. But instead, he has to deal with the humans in the house. Frankenlouse 1994 Nick Reber, 14, is a student at Blister Military Academy, where his father is commanding officer. Nick’s parents are recently divorced. Nick’s passion and talent are in the continuing creation of “Frankenlouse” comics. One big conflict Nick must resolve is his ambivalence about pursuing a military career and strong desire to become a cartoonist. Shoebag Returns 1996 Shoebag’s family has moved to Miss Rattray’s School for Girls. This year there is one boy there who is having a hard time adjusting to the environment. Shoebag feels for him and decides to become a boy again so he can be his friend. “Do You Want My Opinion?” 1984 in Sixteen: Short Stories by Outstanding Writers for Young Adults, ed. Donald R. Gallo. “The Sweet Perfume of Good-bye” 1988 in Visions: Nineteen Short Stories by Outstanding Writers for Young Adults, ed. Donald R. Gallo. “Sunny Days and Sunny Nights” 1989 in Connections: Short Stories by Outstanding Writers for Young Adults, ed. Donald R. Gallo. “Son of One Eye” 1989 in Scope. “The Author” 1992 in Funny You Should Ask: The Delacorte Book of Original Humorous Short Stories, ed. David Gale. “We Might as Well All Be Strangers” 1994 in Am I Blue? Coming Out from the Silence, ed. Marion Dane Bauer. “The Green Killer” 1995 in Bad Behavior, ed. Mary Higgins Clark. “Like Father, Like Son” 1995 in Scope. “Devotedly, Patrick Henry Casebolt” 1951 as Laura Winston in Ladies’ Home Journal.